Holy cow it's been almost a week since my last post - it's been a hectic week here! 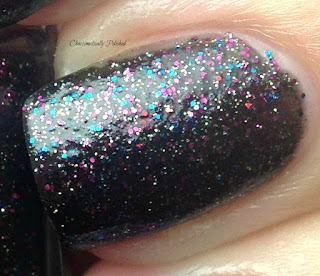 First up is, Butter London's The Black Knight - a stunning, elegant black creme with fuchsia, silver and dark blue micro glitters jam packed into each swatch. 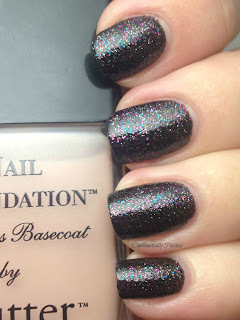 The formula is wonderful, this is two coats without a top coat. 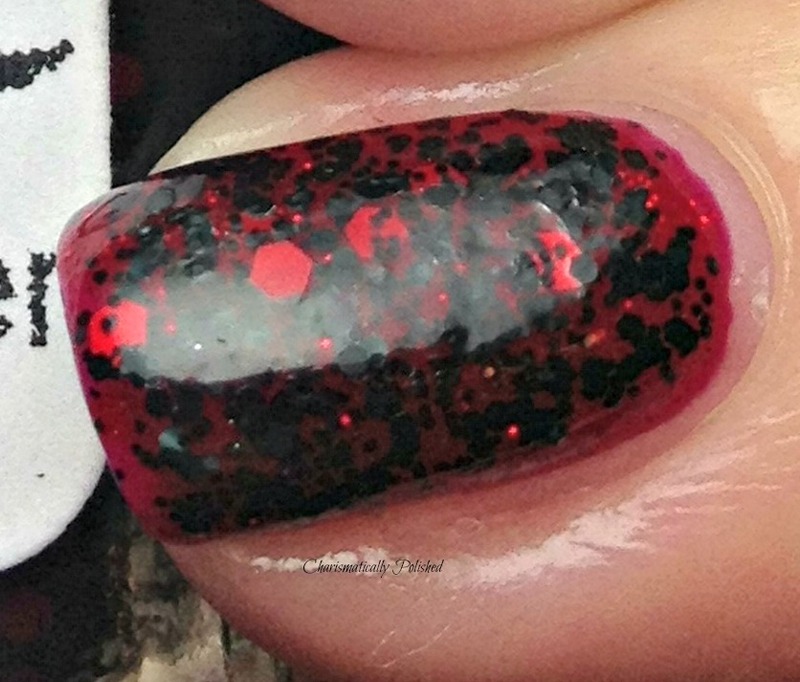 Clean up was easy peasy, and I was surprised at how the black didn't stain my cuticles. So at least now I have a back up for both, however, the Pure Ice was harder to find than Butter London's was. As you can see, PS is pretty much a spot on dupe for BL's The Black Knight. I had no issues with the formula and it does with a similar finish, this is two coats of Pure Ice Private Show with no top coat. Both of these polishes dry with a slight texture, and even after I applied two coats of HK Girl, it maintained a tad bit of grit to it which I was really surprised with. Good Morning everyone! Happy Thursday! 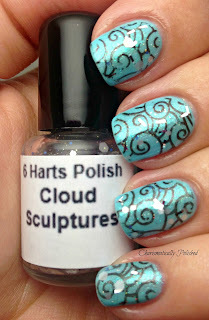 Today I have another review of 6 Harts Craft Co polish. 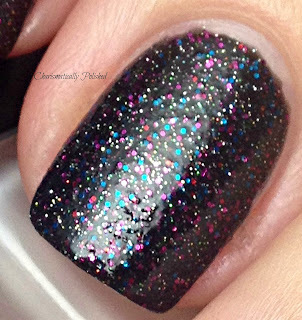 Courtney has produced yet another amazing polish! Let me introduce Summer Skies! 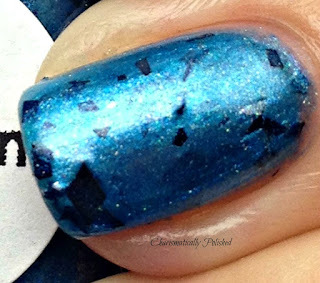 I decided to do a mani completely with 6 Harts polishes with Summer Skies as my base, then I added an easy coat of Secret Galaxy, and I have to tell you, I almost wavered from my original idea cause this was just sooooooo pretty!!! 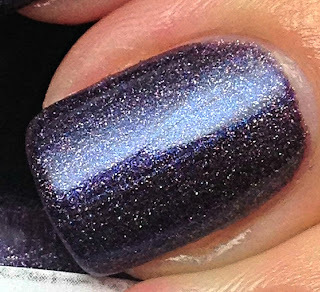 Secret Galaxy totally melds well with Summer Skies and really brings out the green shimmer in it. BUT! I decided to press on! Here I used 6 Harts Bat Crap Crazy to stamp with NC 02. I just love BCC! 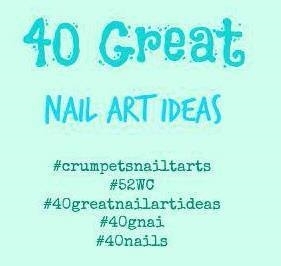 It stamps soooo well, doesn't dry too quickly on the stamper, but applies well and dries quickly on the nail, clean up was easy peasy both around my nail and off the stamper and plates. Though I just couldn't stop there!!! Oh no no no!!! I applied one easy coat of Cloud Sculptures that was released with Summer Skies. 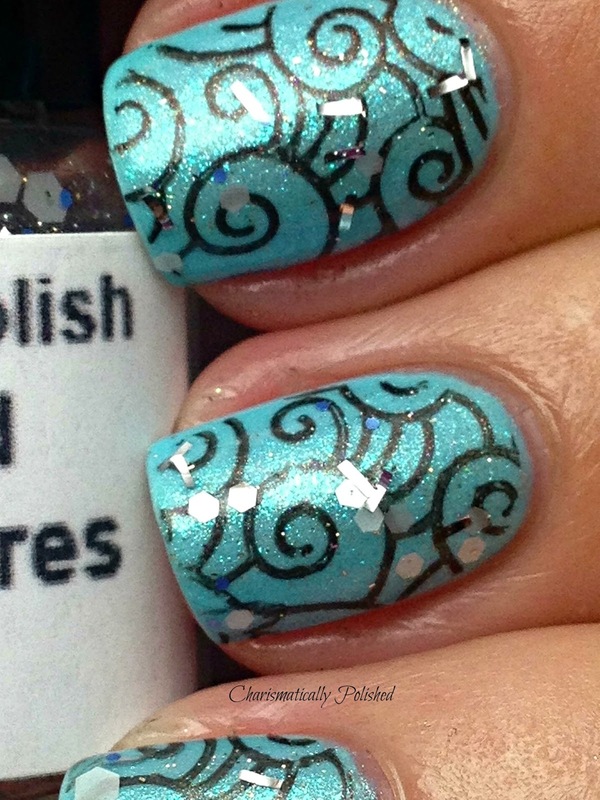 Cloud Sculptures is a clear base with matte silver hex, shiny silver bars with the perfect hint of holo to bring it together. Happy Hump Day everyone! I hope you week hasn't started off too rough? 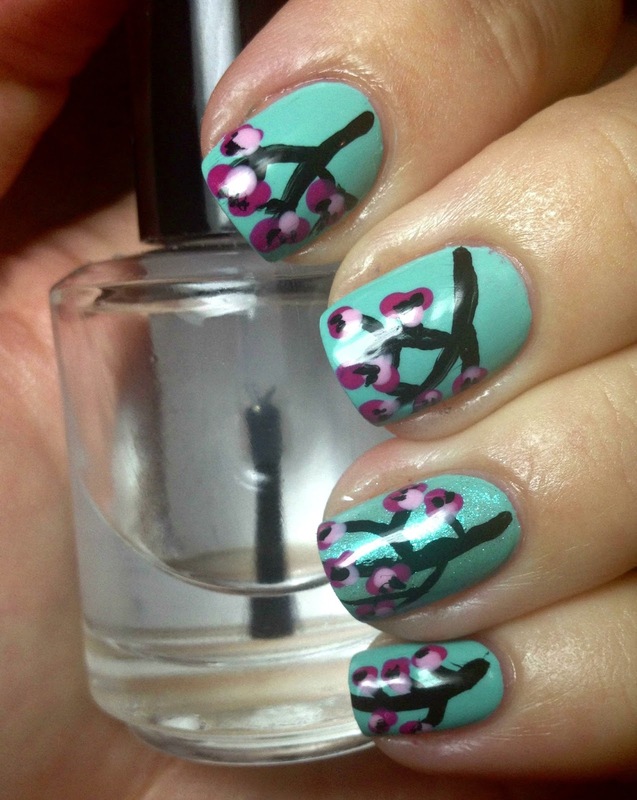 Today I have some nail art, cherry blossoms that were inspired by the Arizona Tea can - and I found several videos on YouTube but this is the first one that I found and chose to follow for my nail art Cutepolish Cherry Blossom Nails. And yes, I'm very aware that there are several others that have done this, and probably did it first, I'm not stating that Cutepolish came up with the technique solo, just that her video is what I chose to copy from. 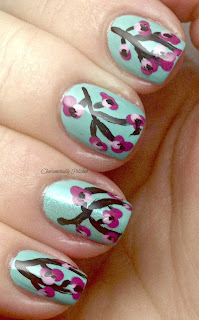 Ok so now that all that is out of the way, here is my nail art. Then I used Cherimoya's black nail art polish to make branches, Cult's Devious Nature and Tempest to make the flowers buds, then topped it off with one coat of HK Girl. My art work definitely needs improving, my lines are WAY thick! 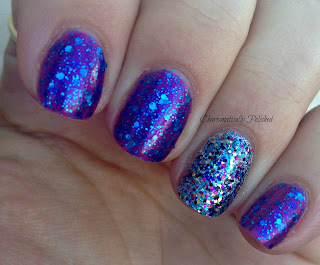 Before we get to the polish, I would like to thanks Candace of Life as Kandistar for helping me with my blog. She was so sweet to help me with the tabs on my blog! If you haven't checked out her blog, you should, she's got great posts and fabulous photos (that's probably because her talents aren't limited to polish and blog support, she's also a pro photographer!) Candace and I met on Facebook and I was fortunate enough to wiggle into the birthday group she was setting up, and it's been the best fun ever! Candace is also about to launch her own polish line, and I'm telling you, you do NOT want to miss it, she made me a glitter-bomb-tastic polish for my birthday and it's A-MAZ-ING! 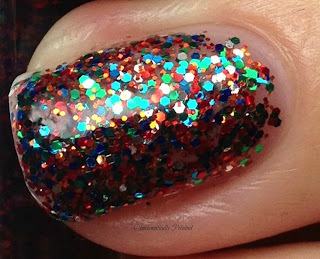 (I really love it, in case you can't tell) so keep tabs on her blog for her launch date. The horcruxes in Harry Potter were items that He-Who-Must-Not-Be-Named had hidden pieces of his soul in so that he could achieve true immortality. In order to destroy HWMNBN, Harry had to destroy each of the horcruxes. 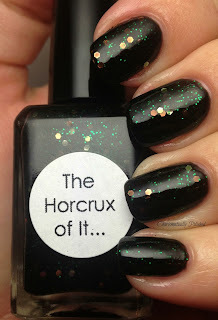 This is The Horcrux of It... a black jelly with small green glitter with larger green and copper hexs. On my nails is three regular coats and no top coat. 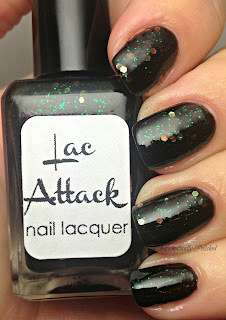 The small green glitters do a wonderful job of twisting the black jelly base into almost a deep black emerald appearance. It makes me think of the Drink of Despair that Dumbldore endured on Harry's behalf to find Salazar Slytherine's locket in the Horcrux Cave. The horcruxes in Harry Potter were powerful magical items that He-Who-Must-Not-Be-Named had hidden pieces of his soul in so that he could achieve true immortality. In order to destroy HWMNBN, Harry had to destroy each of the horcruxes. 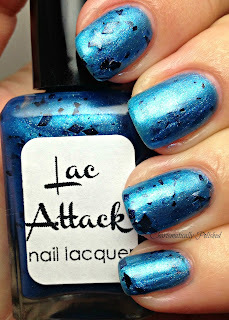 Don't forget to check out Lac Attack's website here and their Facebook page for details on the next release and pre-order of the full sized Magical Musings collection. Hello friends. I hope you've had a wonderful Valentine's Day! I'm afraid mine was about average, but as busy as I've been lately that was a treat. Daughter had a sleepover and hubby and I went for Mexican food, then to sleep by about 8pm. 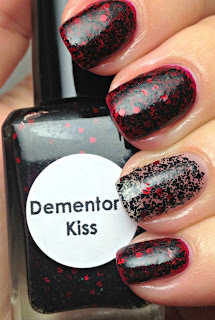 Today I'm continuing the reviews on the Magical Musings collection (the ones I have) and today's post is on Dementor's Kiss. This malevolent beauty will hardly leave you feeling soulless when it sits on your fingertips. Dementors Kiss is a clear base with red matte, small and medium black hex glitter and can be used for layering or used solo. I used one generous coat of it over the top of NYC's Long Wearing nail color in Broadway Burgundy Frost, but used it solo on my ring finger. As you can see, with about 2-3 coats it could be worn alone. 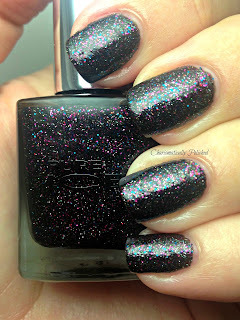 The pictures just don't do it justice, this polish is just stunning in person. 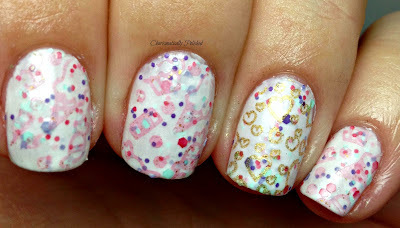 Goodness, it's Wednesday already, and even more crazy, it's Valentine's Day tomorrow!!! Holy cow, didn't we just get done with Christmas?!?! Today's post is part of the Magical Musings collection from Lac Attack found here - she's out of stock right now for this collection, however, if you find them on Facebook there is a link that you can sign up for a pre-order of the set of Magical Musings. I had to fight to get the few I had as I got cart jacked for the whole set and didn't understand why it would let me check out! I've seen some chatter about being cart jacked before and WOW is it frustrating!! 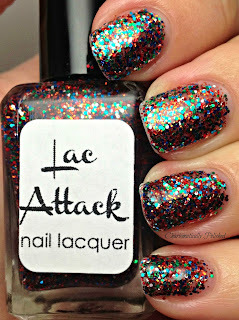 However, I'm really glad that these polishes are getting the attention they deserve, and that it's been a successful line for Lac Attack. It's also nice to know they aren't a limited edition collection, so if you're lusting after any and all, hang in there!!! 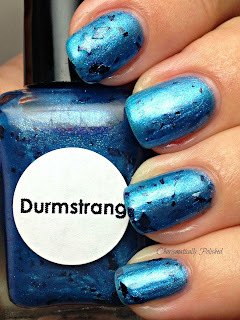 Ok so onto the actual polish......this startling blue beauty is Durmstrang. When they came to participate in the Tri-Wizard Tournament, Durmstrang Institute's bold entrance helped set the stage for the exciting adventures to follow with their fellow wizarding students of Hogwarts and the Beauxbaton Acadamy of Magic. 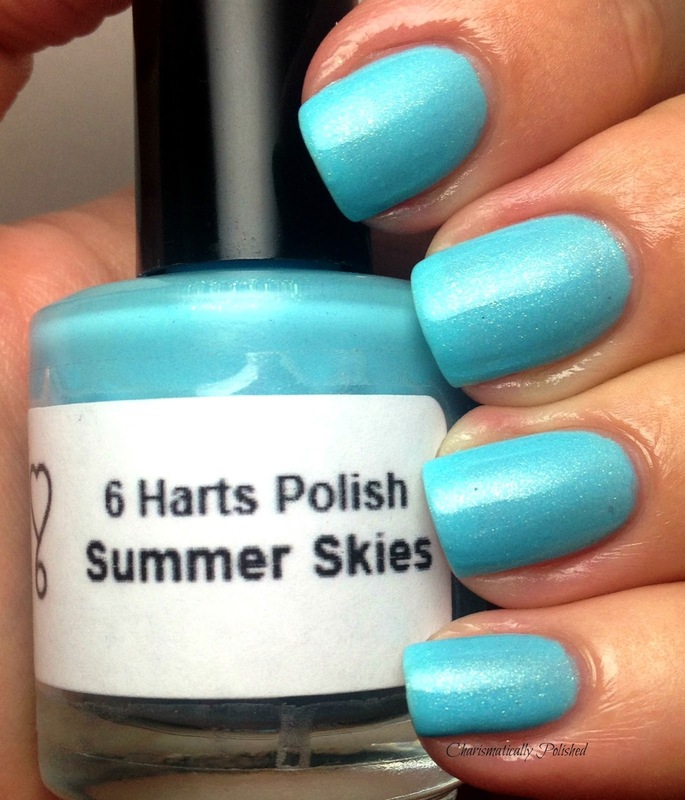 This polish is no different. 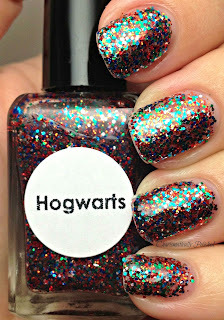 It sets the stage for a spectacular manicure, and will leaving you with almost as difficult a time looking away from your finger tips as Viktor Krum had looking away from Hermione! Durmstrang is a stunning semi-sheer oceanic blue with matte black glitter in small and medium shards. This is three regular coats that applied perfectly with no top coat and I must say that this was a polish worth fighting for. I'm a blue lover through and through and am very happy to have this apart of my collection. 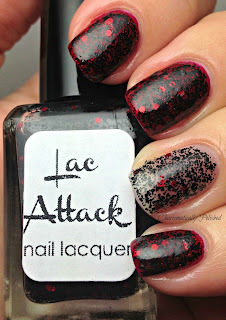 Tune in next post when I review another of Lac Attack's Magical Musings Collection. Ok everyone, I'm really really sorry if I haven't responded to a comment you've posted. I'm still learning how to use Blogger and I've just discovered that there are comments that get sent to spam, and I've also been having troubles replying. Dumb, I know, but I'm trying to get it sorted out. For those that have commented, thank you so much for reading! Thanks for your understanding. Happy Tuesday!!! 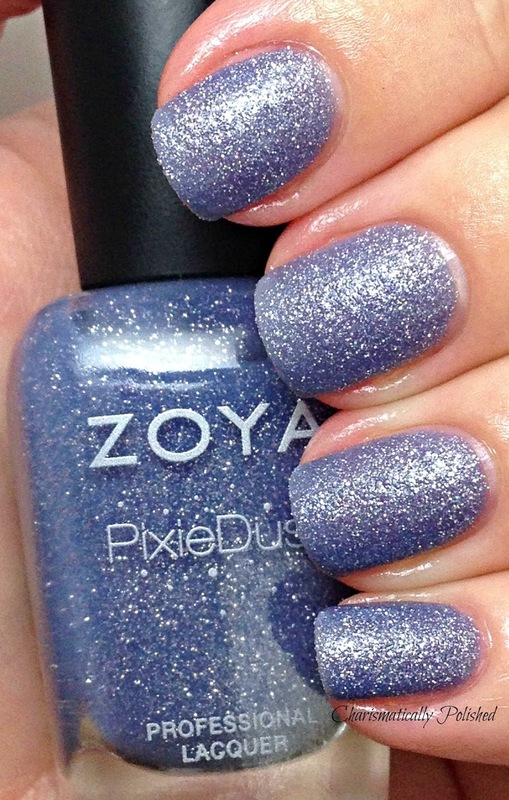 Let's kick off this Monday right, with some lovely Zoya polishes. If you're a lover of Zoya polish as much as I am, you're probably already aware of their new Pixie Dust collection they released the beginning of February. 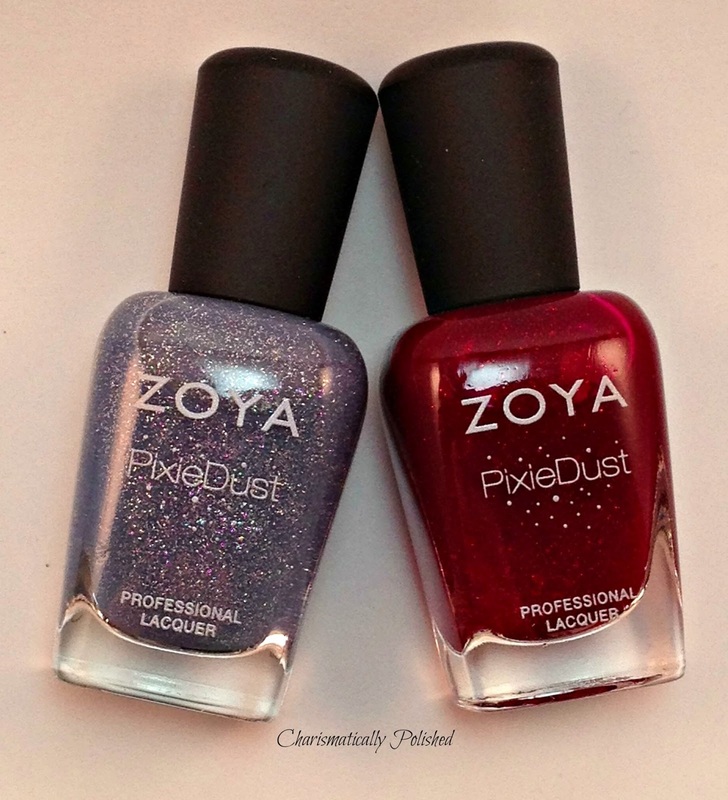 Having discovered my love for textured polish with OPI's liquid sand products, I couldn't resist pre-ordering a couple of Zoya's new line. 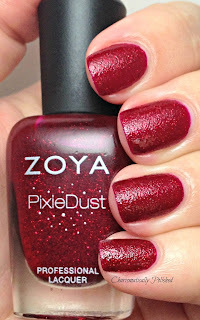 Today I have for review Chyna and Nyx from Zoya's Pixie Dust Collection. First up is Chyna - a classic deep red with a texturized finish that is similar to OPI's Liquid Sand but it seems to dry with a slightly shinier finish, at least Chyna did. This is two coats without a top coat. 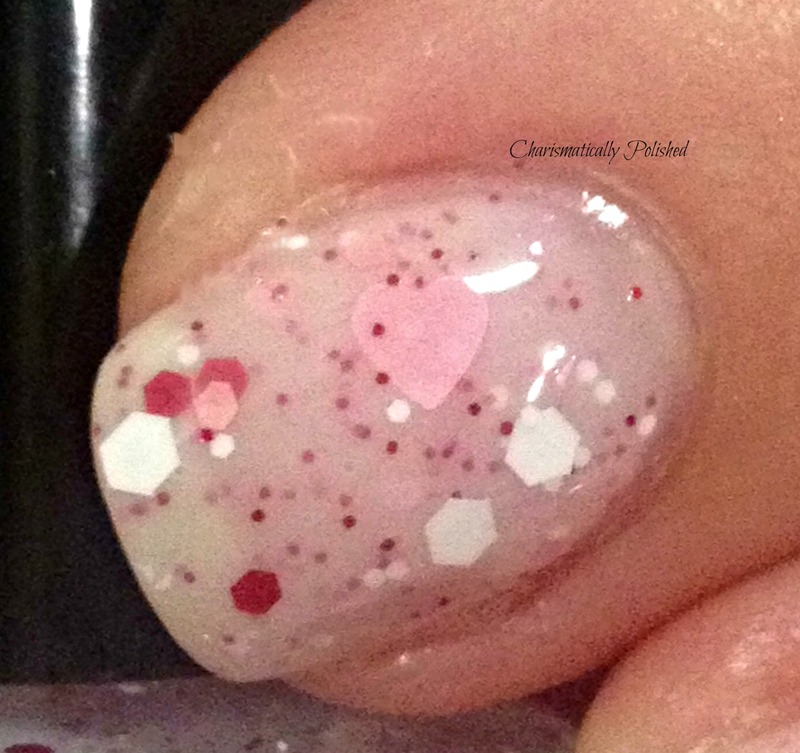 The formula is a bit thick, but doesn't dry too fast so you have time to smooth it out and manipulate it. 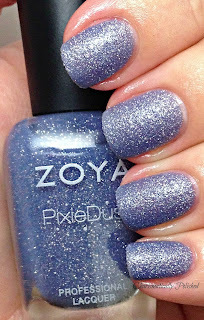 This is Nyx, a beautiful light storm cloud gray/blue with what I perceive to be a slight lavender tone. Nyx wasn't as thick as Chyna and this is actually three coats of Nyx with no top coat. The formula is still great though, I had no issue with applying it, and it has the same texture as Chyna. Happy Monday everyone! I hope you have a wonderful week. Happy Saturday my dears! To kick off your weekend, I'm having a sweepstakes for my current readers and followers on Instagram. 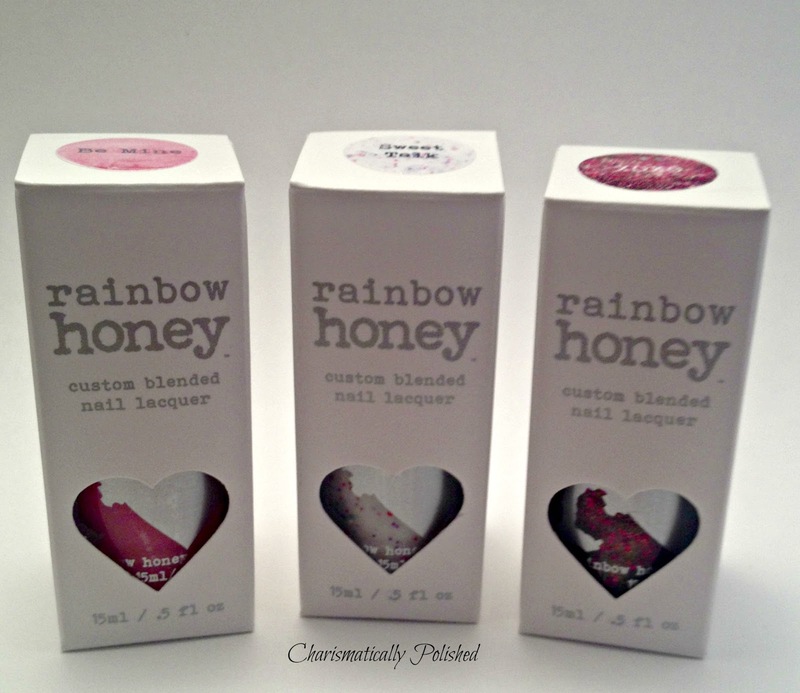 The prize is Rainbow Honey's latest collection, The Sweetheart Collection. This sweepstakes is for current followers only, and any new followers are ineligible for this giveaway. Standard sweepstakes rules apply, see 'Official Rules' below for details. The prize was purchased with my own money, Rainbow Honey has no knowledge this sweepstakes, did not sponsor it nor is participating in any way with this sweepstakes. Facebook does not sponsor or support this sweepstakes. Void where prohibited by law. Winners will be chosen at random via the sweepstakes host, Punch Tab. Winners will be contacted via email for contact information to send the prize. This sweepstakes will be open internationally, but as usual, I cannot guarantee that the parcel will reach you. All I can do is pack it well and provide tracking numbers. By providing your email/Facebook for entry you agree to all rules, regulations, exclusions and stipulations of this sweepstakes and confirm that you waive any liability to this blogger, sweepstakes host, Facebook or Rainbow Honey. 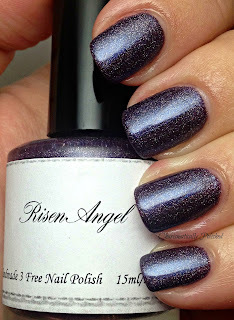 Today, I have a review of Above The Curve's Risen Angel which is one of their Fallen Angel Collection. Above The Curve is just one of the fabulous polish children of Angel and Shawn that can be found here on Big Cartel and on Etsy. 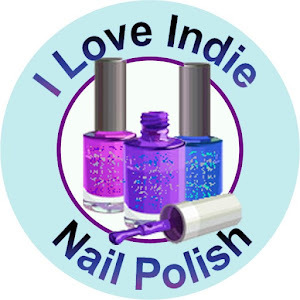 Apart from being a great husband and wife team, Above The Curve is an indie polish brand with a cause, with $1.00 from each polish purchase going to the Shiners Children's Hospital. Risen Angel is a beautiful deep eggplant color with the perfect amount of holo in it.This is two regular coats of Risen Angel, with no top coat. The formula is just perfect, no issues with applying it, the brush size is just right, cleanup is easy (it doesn't seem to to stain), and it dried really well. And since it's been a couple of days since I applied this, I will tell you that the wear is also amazing, I've done dishes, washed my hair and it's still holding fast with hardly any tip wear. 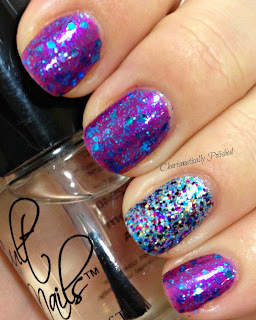 I have to really inspect my nails to see it, and I'm really pleased that this polish has held up to my wear and tear. 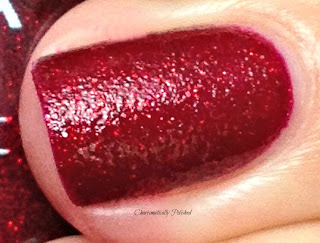 Here's a close up of Risen, and while I'm pretty happy with the photo, it really doesn't do it justice. ATC has a great variety of polishes on their site, so don't pass them up! They are on Facebook and their shops can be found on Etsy and Big Cartel. Well lovlies, February is here and that means Valentine's Day. This holiday of love has been around since the ancient Romans, and while I'm sure that things of change a bit in the way of celebrating, the foundational expression of the holiday remains steadfast. 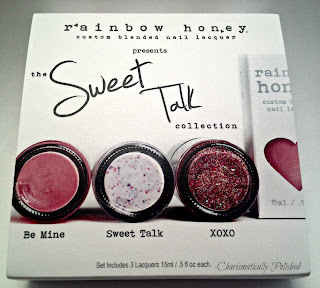 And in the spirit of new celebrations for Valentine's Day, today's post is on Rainbow Honey's Sweet Talk Collection which can be found here on their website. Be warned, you will not find it easy to browse and not buy! Be Mine, Sweet Talk, XOXO are the contents of this latest collection. polish with fabulous gold shimmer. 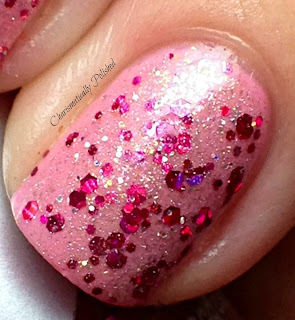 This is now probably my most favorite pink - not too bright, but not too light either. This is two regular coats of Be Mine with no top coat. The formula was amazing and applied perfectly, clean up a breeze. 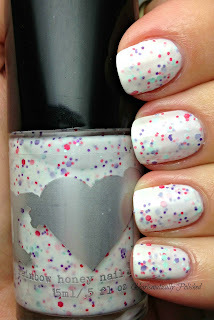 Next up is Sweet Talk - this is a beautiful white jelly with glitter that boasts the entire collection of Sweetheart Message Heart colors. The formula for Sweet Talk is a bit thicker than Be Mine, and does take a bit of patience with the application. This is two regular coats, with no top coat. 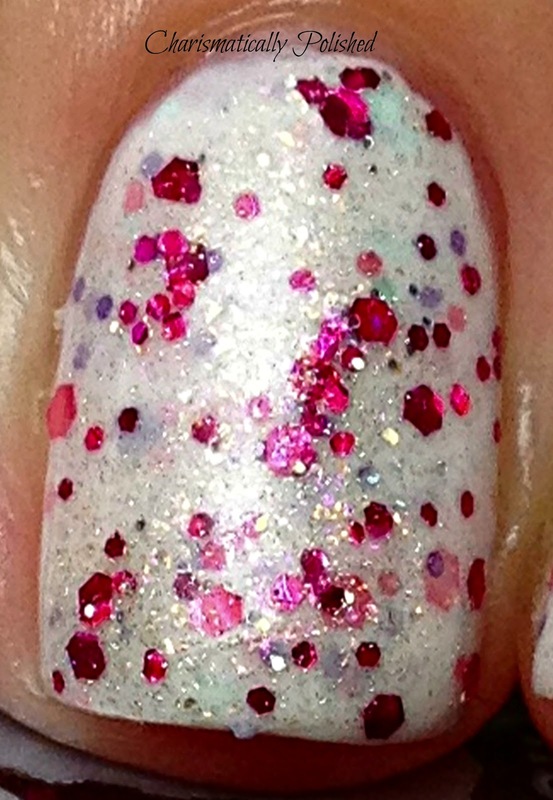 I love the muted look of the glitters from the first coat underneath the second, it gives the polish such a great depth. I couldn't resist trying a stamp over Sweet Talk, so I experimented with Be Mine and Gilded Angel to see how it would look. 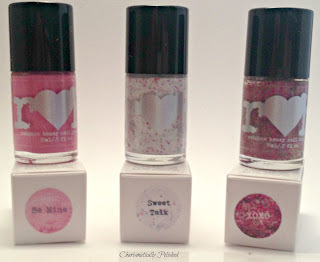 Be Mine stamps well, but is a subtle color and would probably be better with a much darker base. Gilded Angel on the other hand was a good match, at least for me. And for the finale, we have XOXO - the perfect fuchsia hex and heart glitter in a clear shimmer base to seal your mani with hugs and kisses. 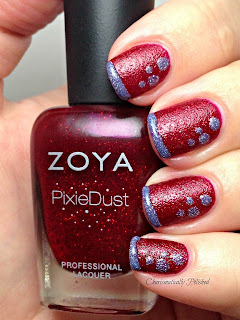 XOXO has a perfect formula and I had no need to fish for glitters, the brush plucked them up from the bottle without coaxing. 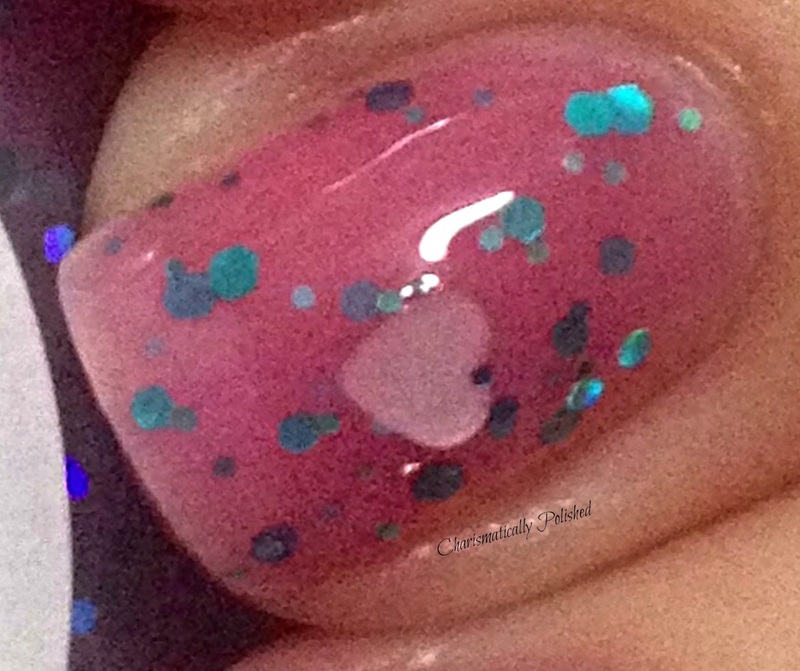 This is one coat of XOXO over Be Mine - per Dee's tip from a previous mani, the glitter is best dabbed on then smoothed out. Check out all that glitter and shimmer! 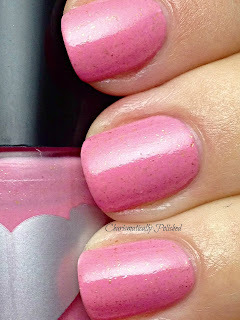 This is one coat XOXO over Sweet Talk with no top coat. I hope you all liked this post; stay tuned as I have a giveaway planned. This giveaway will be for my current followers only and available internationally. 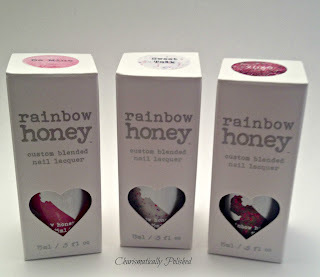 These products were purchased with my own money - the contents of this post are my own honest opinion of the products. I have received no compensation of any form for the review.